In 1933, Naruse first found real critical success. Two of his films for that year made it onto the Kinema Junpo list of ten best films, with the present film at number four and Yogoto no yume (Nightly Dreams) at number three (1). This success was a long time coming. Naruse had started as a prop assistant at Shochiku in 1920 (at the age of 15) and spent many years as an assistant director, before finally being allowed to direct in 1930. Although he received support and praise from his fellow directors at Shochiku, particularly Heinosuke Gosho and Yasujiro Ozu, studio head Shiro Kido remained distinctly unenthusiastic. Apparently, he was bothered by Naruse’s shy disposition and somber demeanor. Even Naruse’s success in 1933 did little to change Kido’s mind. For his first film of 1934, Naruse was given a script no-one else wanted to film and a second-string cast – and his request to make a sound film was rejected. Luckily, PCL (a photochemical and film processing business that would later become part of Toho) had decided to expand into the movie production business – and urgently needed good directors. So Naruse moved to this new studio, as one of its prestige directors. On the 1935 Kinema Junpo list, Naruse’s Tsuma yo bara no yo ni (Wife! Be Like a Rose!) won the top spot. 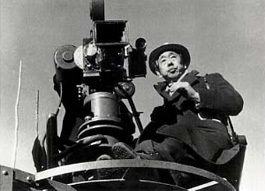 Naruse would remain at PCL/Toho for the remainder of his career (albeit with some disruption at the very end of the 1940s and the start of the 1950s, due to labour unrest at his studio). Before considering the plot of Kimi to wakarete, it might be useful to consider the film’s name. The standard English title (Apart From You) sounds a bit stilted and suggests an abstractness and passivity that one does not find in the film or in the actual Japanese name. The Japanese verb used denotes not simply “parting”, but the process of parting, including the exchange of “farewells”. Moreover, the form of the verb used suggests a degree of necessity and immediacy. Thus, the Japanese title should evoke something more like “I must say ‘Goodbye’ now”. The principal cast of Kimi to wakarete is small, just three people – Kikue, a middle-aged geisha (Mitsuko Yoshikawa), Yoshio, her son (Akio Isono), and Terugiku, a young geisha (Sumiko Mizukubo). Yoshio is embarrassed by his mother’s profession. Having become bored with school, he has taken up with a gang of similarly aimless youths. Kikue, in addition to worrying about her son, is having troubles of her own. Her most dependable patron is getting bored with her – and appears to be on the lookout for some younger, more vivacious geisha. On the other hand, it would seem that Terugiku has little to worry about herself – she seems troubled only due to concern for her closest friends, Kikue and Yoshio. The first segment of the film comes to a climax in an angry confrontation between mother and son. Terugiku, trying to repair the rupture between Kikue and her son, invites Yoshio to come along with her, as she journeys to her hometown to visit her family. The second section begins as an idyll, as the two young people travel by train on the lengthy journey to Terugiku’s home. All seems well still, when Yoshio meets Terugiku’s parents, younger sister and little brother (the always remarkable Tomio Aoki). The cozy mood evaporates, however, when the issue of family finances must be discussed. As it turns out, Terugiku’s father is a drunkard ands a wastrel, relying almost entirely on her earnings to support the entire family. Finding her current earnings insufficient, Terugiku’s father has decided that a second daughter should be sold into geisha-hood. Terugiku refuses to cooperate in finding a buyer for her sister, saying that her sister at least should remain “pure” and that she will do what it takes to earn more money for the family by herself. After this explosion, she and Yoshio go down to the ocean shore – for a long walk and a long talk. As it turns out, she expected problems at home – and wanted Yoshio to see how his “disreputable” mother was a much better parent than her seemingly respectable petty bourgeois father. Back in Tokyo, we expect things to begin to go more smoothly, Yoshio having vowed to treat his mother right (and to get back to work at completing his school career). But while the young folks were away, Kikue’s relationship with her long-time patron reached breaking point – and she takes some rather drastic action. While Kikue recovers at home, under the watchful eye of Drugi and Yoshio, he is summoned by his gang mates for an explanation of why he has stopped participating in the gang’s activities. When he informs them that he is quitting, he is first taunted and then beaten. When Terugiku intervenes, she winds up being injured herself. We then move to Terugiku’s hospital room – and learn she is recuperating well. At this point, she finally tells Yoshio that she must leave to take a better paying job, far from Tokyo. We do not know exactly what this new job entails, but can reasonably fear that it involves increased degradation for our heroine. In a coda, we see the two young people at the train station, as Yoshio sees Terugiku off on a journey from which she clearly expects not to return. This film offers at least a couple of obstructions and difficulties for modern viewers. The most grating seems to be Isono’s performance as Yoshio. He looks too unprepossessing (and too old) and behaves positively lumpishly. For whatever reason, the Japanese film industry of that day typically did not use teenage boys to play the part of teenage boys. I think it is crucial to realise here that both Yoshio and Terugiku are even younger than we might initially assume, probably no more than 16 or 17 years old – still just children, though hovering on the edge of adulthood. While Mizukubo, with her very large and very bright eyes, might pass visually for a girl of such an age, Isono doesn’t quite look the part. But, if we can get past this problem, we should be able to see that his portrayal of a youth nearing the end of middle school (9th grade in Japan) is largely on the mark. He is naïve and taciturn and has trouble expressing himself clearly, and his outlook and behaviour is still quite immature. Moreover, at the outset, he is still young enough to have little or no interest in “girls” – Terugiku is seen as little more than a solicitous sisterly figure. The second obstruction is the frankly very melodramatic plot. If one watches this film purely for its story, it is likely to seem somewhat cliched and at least a bit disappointing. I would suggest, however, that what is most important when watching this film is paying attention to how Naruse shows us things. His visual narration is playful and often quite striking. While Kimi to wakarete, like most Shochiku films of the era, has a firm grounding in Classical Hollywood style, one notes early on some significant idiosyncrasies. First of all, Naruse seems particularly fond of what might be called deceptive shots. A dropped bowl of noodles turns out to be the daydream of a sleepy young geisha. A mysterious man in a dark alley is later revealed to be only a cook on break, playing his flute. An entire scene unexpectedly turns out to have been shot in a mirror, something we discover only as the mirror is being covered. One also notes particular emphasis on the very edges of the frame. Characters often walk right into or out of the front corners of the image. Similarly, Naruse frequently presents a virtually empty image and then pops things into it. Thus a bare bit of street might have a can kicked into it, followed by a foot, which then proceeds to kick the can back out. Another bit of street might have things drop onto it, from outside the top edge of the image. After having unexpectedly pushed things and people into the frame from all sides, Naruse proceeds to push something “into” his frame right from its centre – cutting from a closed white sliding door to a totally over-exposed, whited-out shot of a room interior that reveals a figure in its centre as soon as the exposure begins to return to normal. Naruse also pushes his camera at his characters, dollying in on them at moments of high emotional tension. Naruse also makes extensive use of parallelism. One of the most striking instances here involves cutting between shots of a couple of young geishas entertaining some relatively young customers and shots of the final confrontation between Kikue and her disgruntled patron, just across the hall. This lengthy sequence not only presents a counterpoint between the two situations, but also uses a great deal of circular imagery. Thus, we see a spinning phonograph turntable, and tilt up to a hand turning the reel of a projector, then cut to a customer dancing. A bit later we see a geisha (now garbed as a gypsy dancer) turning as she dances – and then cut to the legs of Kikue and her patron spinning as if dancing. Certain aspects of this double sequence are echoed later – in the confrontation between Yoshio (and Terugiku) and his former gang mates. Finally, I would note that some sequences of this film are, even without analysis, simply beautiful. The train journey of Terugiku and Yoshio is one of these. It is the happiest portion of the film – full of sweetness and a sense of wistful hopefulness. Even more visually impressive and moving than this section, however, is the scene between the two young people on the rocky ocean shore after Terugiku’s violent confrontation with her father over the fate of her younger sister. Part of the credit for the visual beauty of this film needs to be shared with the cinematographer Suketaro Inokai, who also shot Naruse’s Yogoto no yume that year and later shot some of Hiroshi Shimizu’s loveliest films including Kanzashi (Ornamental Hairpin, 1941) and Utajo oboegaki (Notes of an Itinerant Performer, 1941). And finally, some of the credit here also needs to be given to the utterly radiant Sumiko Mizukubo, who appeared on the Japanese cinematic scene in 1932, gave a number of lovely performances for Shochiku’s best directors (in addition to working with Naruse, she made films with Ozu, Shimizu, Shimazu and Gosho) and then worked briefly at Nikkatsu (making films for directors who are now wholly unknown) before disappearing from the cinema forever in mid-1935. For the record, the number one film for 1933, according to Kinema Junpo, was Yasujiro Ozu’s Dekigokoro (Passing Fancy) and the number two film was Kenji Mizoguchi’s Taki no shiraito (The Water Magician). Michael Kerpan is a bureaucrat who loves Asian cinema, especially the films of Ozu, Naruse, Shimizu, Yamanaka and Mizoguchi.